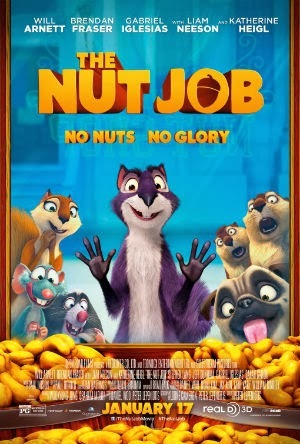 Despite an interesting premise, The Nut Job and its fairly large cast of uninspiring characters fails to make this an animation classic. It is still worth watching especially if you have young children who will enjoy the cute farting characters. But for adults, the numerous body function jokes show us that the filmmakers just were not trying hard enough to make this enjoyable for everyone. I was able to watch the film in 3D but aside from one scene where you have popcorn exploding everywhere towards you, you would not have noticed it. Otherwise the graphics are good not great with each character despite its large cast being very distinguishable from one another. The movie is a joint effort by three animation studios from Canada, South Korea and the United States. But with the animation fairly adequate, it's the plot and voice acting that keeps the film from reaching its potential despite the interesting premise. The story is about a squirrel named Surly (Will Arnett) who is pretty much a loner except for his friend the rat. However, why he is such an outcast and what has led him to this decision is pretty much a black box by the filmmakers. In addition the animosity between him and the Raccoon (Liam Neeson) from their past is not explored at all. What I do like is the parallel between the two ongoing stories between the humans trying to rob a bank and the animals trying to rob the nut store of its nuts. The voice actors aside from Brendan Fraser and Liam Neeson are mostly flat in their personalities and indistinguishable. The mole (Jeff Dunham) seemed like such a pointless character. Overall, I would recommend this movie if you have a young child as they would love it. Otherwise, catch it as a matinee or wait until it comes on Netflix. For a better animation for yourself and the whole family, go see Frozen or rent The Croods. First Look at DC's "Son of Batman"
The Night Crew is Shooting Now!